You’ll agree with me that, for a high configured mountain bike you have to spend over thousand bucks, but if you don’t want to spend lot of cash for your entry level biking experience then you can check affordable bikes that’s currently available in the market. You can check our comprehensive list of best mountain bikes under 300 dollars to find the best bike for you. By Zachary Anderson: We have updated the article to give the most accurate information regarding mountain bike for the rider who are looking for. Some of the listed bikes have replaced with new one to assist individuals in finding the best mountain bikes currently available online. To find a budget mountain bike at affordable price is not so easy that’s why we made this list by researching countless hours on various platform and user reviews to give you unbiased information about each bikes. We have compiled a list of hardtail & full suspension mountain bikes. So among this two types of mtb bikes you can select your best one which fit most. At the beginning of hardtail bike category we have listed a robust bike that is perfect for large bodied rider. The Blackjack 3.0 29er Mountain Bike from Vilano provides you all your biking requirements as this bike is full of amazing features and can outperform many of its high-priced competitors. Moreover, aside from mountains and trails, you can also ride this all-around bike on pavements, paths and dirt roads with ease and comfort. 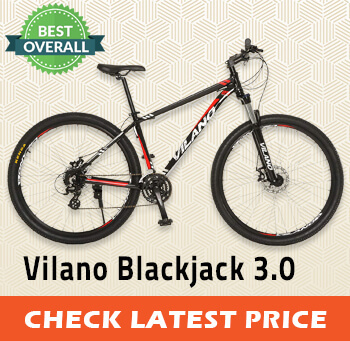 The first thing you notice about the Vilano Blackjack 29er Mountain Bike is its sleek, sturdy frame. This hardtail frame is wholly handcrafted using Butted 6061 aluminum alloy, and hence it is incredibly lightweight and super durable. Lightweight bikes are easy to control and provide ample comfort to the rider’s body. Moreover, the geometry of the frame was made to take over a variety of terrains with ease. Vilano decked up the handmade frame of this Blackjack bike with a pair of 29 inches wheels that come with double wall alloy rims. These wheels along with the 80mm travel front suspension roll over every roots and rock that comes along the way while absorbing the shocks and bumps of the road. The Vilano Blackjack 3.0 mountain bike comes with 8-speed Shimano EF-51 Integrated gear shifter installed to it. This integrated shifter makes changing between one gear to another and gaining speed really easy and effortless. No matter how fast and quick you are riding, you can shuffle between gears in no time. Finding the perfect entry-level bike is difficult. But when you have the Vilano Blackjack 3.0, you will be amazed by its performance and comfort level. This bike was designed to meet all our riding needs and you won’t be disappointed after spending your money on it. Raleigh Bikes introduced the first ever Recreational Mountain Bike with the name of Eva 1. Eva is a line of women’s bike that was specially designed keeping in mind about the specific needs of a delicate women’s body. The Eva 1 is a recreational bike that can be used for mountain and trail riding as well as riding through city roads and neighborhood. The 27.5 inches High Tensile Steel material constructed frame is lightweight and extremely durable. This bike is guaranteed to last for generations with proper care. Moreover, the frame features a women-specific geometry that is very much comfortable on women’s body. With such up-right position, the rider body remains out of pain and strains due to long hours of riding. Even though the Eva 1 is a beginners level woman’s bicycle, Raleigh Bikes installed 21-speed drivetrain from the World Class Shimano brand to give it a more advanced feel. This drivetrain not only provides a wide range of gears to choose from but also makes shifting gears much easier. With this gear shifter, you can change gears by just a simple twist of your wrist. Women’s bikes are bound to have some of the top safety features because women have delicate body types. To provide immediate stopping power, the Eva 1 bike consists of alloy V-brake that stops the bike as soon as you press the brake. If you are looking for a feminine mountain bike that is budget-friendly yet provides very decent performances, then the Eva 1 from Raleigh Bikes might be the best choice for you. This bicycle has some high-end components and can be used for any riding purposes. Looking for a decent mountain bike for men at a budget-friendly price tag? Then consider this one. The X1 Mountain Bicycle from EUROBIKE is one of the gorgeous looking mountain bikes that you will get under $300. This bike was designed for student group for everyday college riding as well as not-so-frequent riding on mountain trails. The bike features a beautiful colored frame made of High Tensile carbon steel that is strong and capable of enduring almost anything. The colour combination and the outlook of the bike give a strong sense of sportiness and athleticism. Moreover, because of the construction material, this mountain bike is quite lightweight and extremely durable. There is more to this bike other than its striking outlook and durability. EUROBIKE incorporated world-class Shimano EF500 21-speed gear shifters to this X1 mountain bike so that the riders have a wide range of gears to choose from. And gear changing with this shifter is also straightforward and effortless. As it’s easy to gain upward and downward speed with this X1 mountain bike, an excellent pair of brakes is a must. And for this reason, EUROBIKE installed disc brakes to both front and rear of the bike to ensure maximum stopping power on any surfaces. If you want to buy a new bike that not only delivers phenomenal performance but also has an excellent outlook, then the X1 mountain bicycle from EUROBIKE is just the bike for you. This solid-built bicycle will add value to your riding experience. 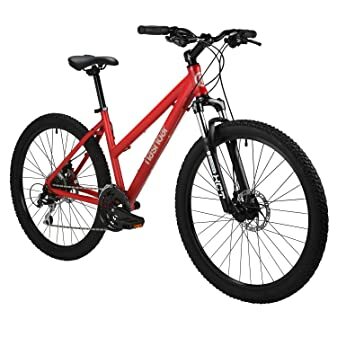 The Nashbar Women’s 26″ Mountain Bike is one of the top rated women’s bikes that you will get at a very reasonable price range of just under 300 Dollars. This bike was specially designed for women who enjoy riding; be it mountain riding or just cruising through the neighbourhood. Why is this bike on your list? Several mind-blowing features helped the Nashbar Women’s Bike to make its way to our best mountain bikes list. 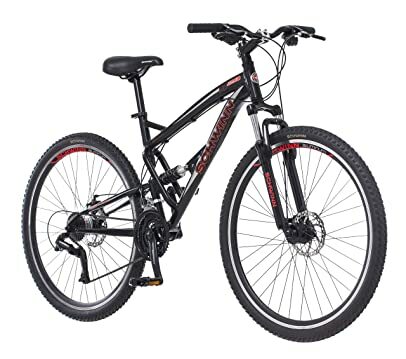 This mountain bike ensures excellent comfort and safety for a delicate women’s body. To begin with, this Nashbar women’s bike has a step-through designed frame that is constructed from TIG-welded aluminium for extended durability and amazing stability. The frame design makes getting on and off the bike super smooth and effortless for a woman. Furthermore, the extremely wide wheels of this bike are decked-up with a 80mm front suspension fork that rolls the bike over almost any obstacles and soaks up all the shocks of the road to provide a comfortable, bump-free riding experience. For amazing safety measures, Nashbar included mechanical disc brakes in both side of this mountain bike. The pull brakes deliver immense stopping power and stop the bike on the spot as soon as the brake lever is pressed. 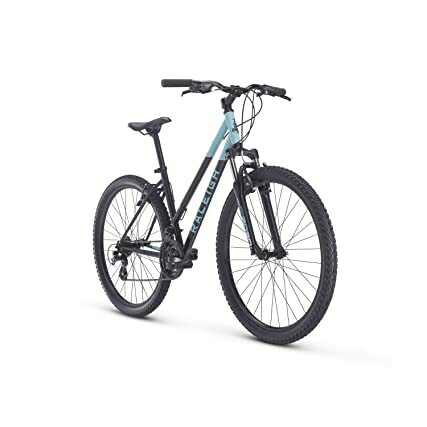 The Nashbar Women’s 26″ Mountain Bike is an excellent bike for women at a very affordable price tag. This bike not only makes a style statement but also performs well. So if you want to buy a new bike for female rider, don’t waste your time to search for any other bikes. The S29 Mountain Bike from Schwinn is one bike that is filled with extraordinary features and services. Specially designed for men’s hard physic, this mountain bike is affordable and at the same time full of excellent performances. Furthermore, this bike even doesn’t lack in the design section. The alluring, masculine outlook of the bike is sure to attract a lot of prying gazes. The frame holds the whole bike together and therefore it needs to be strong and sturdy. 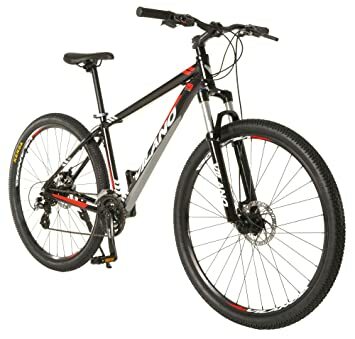 Schwinn constructed the structure of its S29 Men’s mountain bike with the butted aluminum alloy which makes the frame extremely strong yet super lightweight. Lightweight bikes are easy to control and are very comfortable to ride on. Furthermore, aluminum alloy makes the frame and the bike extremely durable. One bike might last for generations with proper care and maintenance. To protect the durable frame and rider’s body, this Schwinn S29 bicycle comes with front and rear suspension fork from SR Suntour attached to its super wide set of wheels. These forks combined with the 29 inches wheels can roll over rugged and rough trails effortlessly without having to face any bumps and shocks of the road. Because of these forks, the rider enjoys an impact free ride and experiences better control over the bicycle on any types of roads and trails. Brakes are the most crucial feature of a bike’s setup. And for this reason, the Schwinn S29 mountain bike comes with front and rear disc brakes installed to it. This brakes not only provides amazing stopping power but also makes sure that the rider is able to avoid any collision or any unwanted events while riding the bike. This S29 Men’s Mountain Bike from Schwinn is an exceptional bike that will definitely provide the best value for your money. This affordable bike speaks comfort and control and therefore, its high time that you try one for yourself. Like Men, we have listed Women’s full suspension bike for comfortable ride. If you are looking for an extremely affordable full suspension mountain bike for women then the Falcon Full Suspension Mountain Bike from Merax is an excellent option for you to consider. You can enjoy riding this bike on rough, rugged mountain trails as well as on plain city roads with much ease and comfort. Even though it is super inexpensive, this bike doesn’t fall short when it comes to features and performances. Additionally, Merax installed high-end, super performance components for an unmatchable service. A great design attracts a significant number of customers and the Falcon Full Suspension Mountain Bike from Merax features an alluring design that attracts customers as well as provides a lot of phenomenal performances. It constructed the sleek and beautiful frame of this bicycle with the heat-treated aluminum alloy that is lightweight yet very sturdy. Moreover, the alloy frame can withstand any rugged terrains and offers long-lasting performances. This full suspension mountain bike comes with 21 different speed settings that provide the rider with a wide variety of gears to choose from. The Shimano 21-speed derailleurs and shifted effortlessly shuffle between gears and enable you to reach the speed you have been urging for. High speed makes climbing hills even easier. The brakes are one of the most important features of a mountain bicycle as the safety of the rider and others depend mostly on how quickly and smoothly the brakes work. Knowing this fact, Merax installed a pair of linear pull brakes to this mountain bicycle that not only provides excellent stopping power but also stops the bike at the spot without any struggle. Not so comfortable seat post. If you want a great beginner’s level mountain bike without breaking your bank then you must try the Merax Falcon Full Suspension Mountain Bike. Along with its fantastic performances, this bicycle will undoubtedly add value to your riding life. The last one in dual suspension mountain bike category for men. If you don’t feel comfortable on mongoose impasse 29er Mens mountain bike then you can check this mountain bike. The GMC Topkick Dual-Suspension Mountain Bike by KENT is the perfect bike that you have been looking for. KENT designed this mountain bike with the sole purpose of meeting all the requirements of its riders. From rough trail riding to mountain riding and plain city road ridings, this dual suspension bike can hit any trails effortlessly and smoothly. Build quality matters. And that’s why KENT used strong aluminum alloy to construct the frame of its GMC Topkick Dual Suspension Mountain Bike. The aluminum construction doesn’t only make the bike lightweight but also ensures a reasonable price range. Moreover, this aluminum frame features an upright geometry that is comfortable to the rider’s body. Keeping in mind about the rider’s comfort and control, GMC incorporated Zoom suspension forks with elastomer/spring technology to both the front and rear wheels of the Topkick mountain bicycle. These forks provide dual suspension and ensure that the bike moves smoothly over any kinds of terrains while absorbing shocks and bumps from the road. And therefore your body remains impact-free even after a long riding journey. 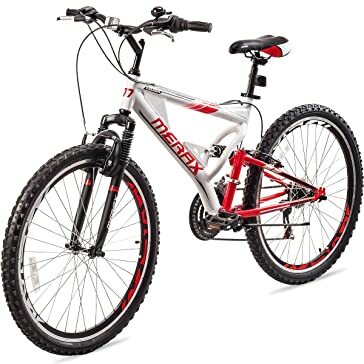 This mountain bike comes with 21-speed micro shift push shifters that not only provides the rider with a wide variety of gears to choose from but also makes shuffling between gears easy and smooth. From switching between your gears, you can reach your required speed and climb uphill or go downhill effortlessly. 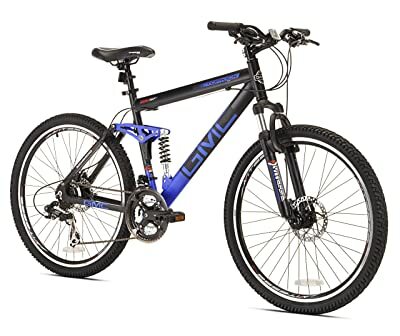 The GMC Topkick Dual-Suspension Mountain Bike will provide you with all the amazing features you were looking for in a mountain bike and that too at a reasonable price range. Even though there are some minor let downs of this bike, it still will provide you the best value for your money. Perfect mountain bike for those who are overweight or large bodied rider to ride over any weather in sand, snow or mud area. For all the obvious reasons, lately, fat bikes have become the centre of attention in the biking world. These bikes are called “Fat Bikes” because they feature super wide tires that give the rider a feeling of floating on the road. 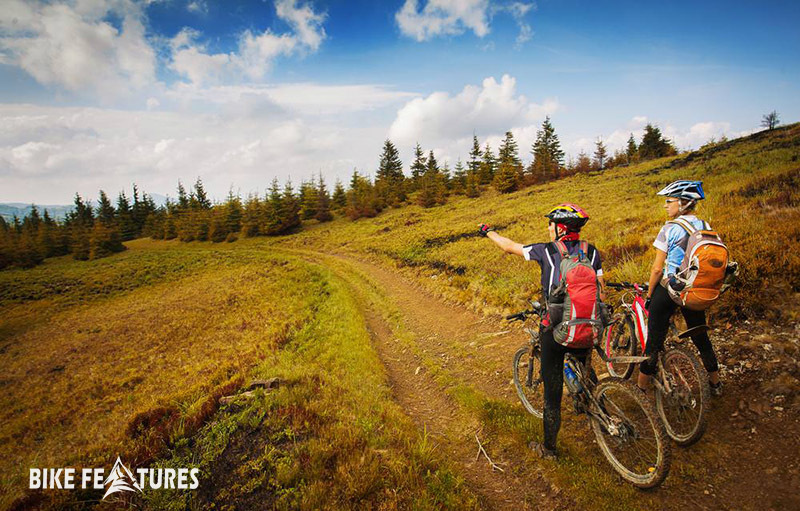 A fat bike allows you to ride to places where other mountain bikes won’t be able to go. 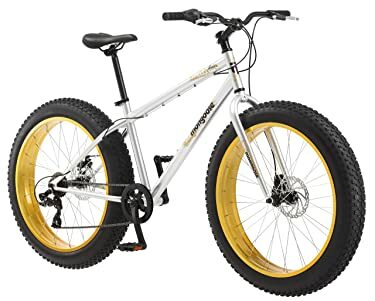 The Malus Fat Tire Bicycle from Mongoose is one of the top rated fat mountain bikes that you will get at a very affordable price range of under $300. This mountain bike was specially designed for the hard physic of men. The cruiser style premium quality steel frame that is adorned with 4 inches super wide tires is suitable for every kind of terrain and weather conditions you can think off. Moreover, the fat tires are capable of rolling over road obstacles with ease and comfort. This men’s fat bike includes 7-speed Shimano derailleur with twist shifters so that you can change in-between gears effortlessly and gain preferred speed quickly. And to keep yourself safe from such high speeds, the Malus bike consists of both front and rear disc brakes that can stop the bike on any ground conditions. The budget-friendly men’s Malus Fat Tire Bicycle from Mongoose is one of the best mountain bikes under 300 bucks you will find in the market. This bike not only ensures comfort and safety but also delivers a phenomenal performance. It is undoubtedly money worth cycle. Looking for a folding mountain bike that can be used for every type of roads and trails? Look no more. 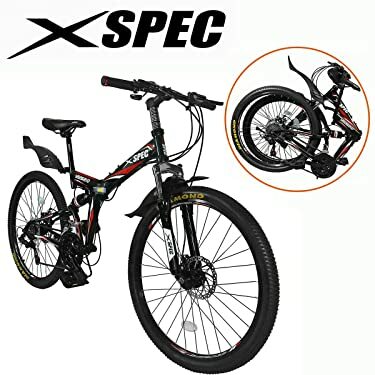 The 26″ Folding Mountain Bicycle from Xspec is not only a mountain bike but rather you can use this bike for everyday activities like riding to college, office or any other type of recreational activities. Constructed from high tensile steel material, the streamlined frame is not only durable, but it also folds into a compact size within seconds. The compact size adds to the portability and storability of this bike. It can be easily carried around and stored in the smallest place imaginable. This Xspec bike has more than its amazing foldability. The 26 x 1.95 inches High-Grade Road tires are adorned with full suspension forks that absorb shocks and impacts from terrain ensuring a comfortable riding experience. Moreover, this bicycle features both front and rear disc brakes to deliver more stopping power to the rider on any road surfaces. Better stopping ability ensures better safety and fewer chances of accidents. If you live in a small city apartment, then this Xspec 26″Folding Mountain Bike folding is a must for you because of its super compact size and its incredible performance. This Xspec bike is an all-rounder bike which can be used for all types of riding. Moreover, this bike is budget-friendly; just spend less than 300 Dollars and enjoy the benefits and performance of a high-end mountain bike. As like adult mountain bikes Diamondback did great job in making mountain bike for youth generation who don’t feel comfort on a adult mountain bike. Searching for the perfect beginner’s bicycle for your junior? The new Diamondback Octane 24 Complete Youth Bike is the answer to your search. This bicycle was specially designed for kids of 8 to 12 years and has a height of 53″-62″. Although it’s a kid’s bike, this Diamondback bicycle is packed with incredible features and performances. Durability is important for kid’s bike as it has to take in a lot of abuse a kid can dish out. And Diamondback knows exactly how to make a bike durable and long-lasting. For the frame construction of Octane 24, Diamondback used the premium quality aluminum alloy which is very strong and lightweight. The sturdy and robust construction of the frame ensures long-lasting durability and can withstand all the abuse of the road and the kids. Keeping the comfort factor of young kids in mind, the Octane 24 comes with HL Zoom 50mm travel fork attached to the front wheel. This fork enables the rider to roll over rocks and roots smoothly by soaking up all the bumps and shock of the road. Even though it’s a hardtail bicycle, it doesn’t fall short in delivering comfort and excessive control to the young rider. The 21-speed drivetrain of the Octane 24 bicycle provides a wide range of gears for the kids to choose from. This drivetrain consists of both front and rear derailleur and makes sure that shifting between such wide variety of speeds smoothly and effortlessly. Finding the best bike for your precious junior might be a tough job as you look for phenomenal performances and severe safety measures. The Diamondback Octane 24 provides you with all the qualities you look for and that too at a very competitive price range. Therefore, you should give it a try before considering other options. What your young girl to become more active and fit? Then buy her a bicycle. A perfect little bike will not only add to her recreational activity but will also make her pro-active. Confused about which bicycle to buy for your precious little girl? Worry no more. The Lily 24 Complete Road Bike from Raleigh Bikes is the perfect ride for girls aged from 9-12 years old and has a height of 4’6 inches to 5’1 inches. This pretty little bike is ideal for riding on mellow trails and cruising around the neighbourhood. The frame of this beautiful Lily 24 bicycle is constructed from 6061 aluminium which made it extremely lightweight and super easy to manoeuvre. This strong frame is adorned with soft PVC grips and a Jr. BMX padded Seatpost which ensures added comfort to the rider. 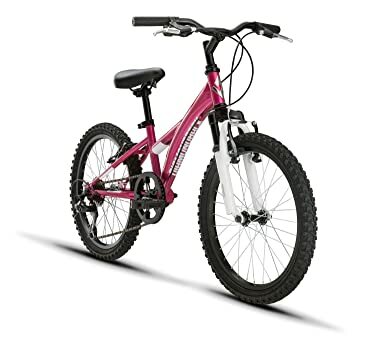 Moreover, this bike features a low stand-over height that makes it easy for such young girls to climb on and off the bike without much effort. Furthermore, Raleigh installed Shimano Revo 7 speed rear shifters to this bike so that the young kids can get used to shifting gears with ease and confidence. This Lily 24 also includes some amazing safety features. The bike comes with alloy hand-controlled V-brakes that delivers enough stopping power to halt the bike smoothly without facing any accidents. 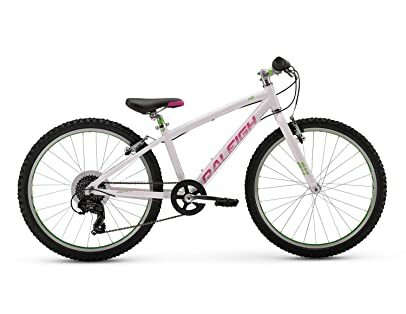 The beautiful Lily 24 from Raleigh Bikes makes for a great entry level mountain bike for pretty young girls. You can buy this little ride for your beloved girl without spending a fortune. This performance-packed bike is super affordable and delivers an excellent value for the money spent. Introduce your little ones to the fantastic world of cycling by buying her a Tess 20 Complete Youth Bike from Diamondback Bicycles. This is the smallest mountain bike produced by Diamondback in the hope of introducing the fun and importance of riding to the next generation of little kids. The Tess 20 cycle was specially designed for young girls who are 5-9 years of age. Unlike many other kids’ bike, the Tess 20 features a frame made of high tensile steel material for extended durability and super stability. The 20 inches aluminium wheels attached to the frame comes with 40mm Zoom suspension fork that rolls over rocks and roots of the terrain smoothly and effortlessly. Furthermore, these combinations of wheels and fork also absorb shock and impacts from the road for more comfortable riding experience. Another great feature of this Diamondback bike is that it includes some amazing safety measures considering the Tess 20 is a bike for kids. Diamondback installed linear pull brakes with reach adjust so that the bike stops as soon as the kid presses the brake handles. This abrupt stopping power not only provides safety but also ensures control over the bike. 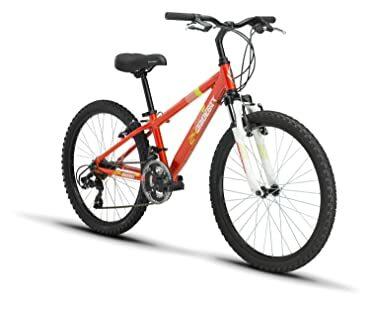 With such affordable price tag, this Tess 20 Complete Youth Bike from Diamondback Bicycles might be the perfect bike for your lovely kids to start biking journey with. With the amazing look and so many great features, this bike will surely be liked by the kid. 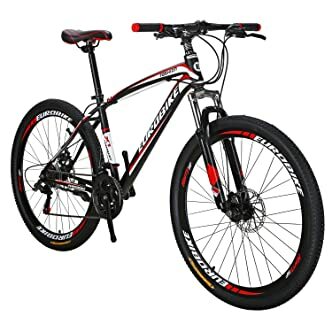 After went through this best mountain bikes under 300 dollars list you may got the information that you were looking for. All the bikes are best for the specific rider as I mentioned in the bike table. Just take the specific one that you suite most. Also you’ll find more bikes for your friends & family as we have listed best bikes under $300 for all type of riders.